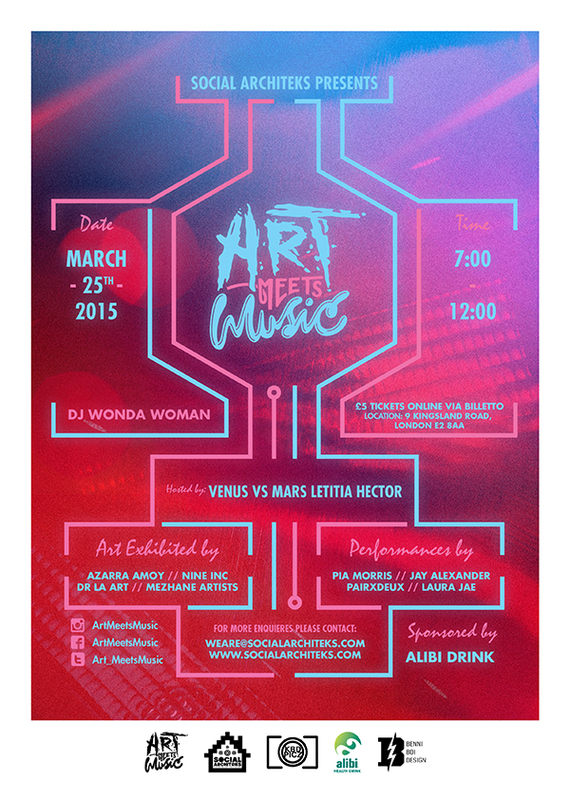 Art Meets Music (Sponsored By Alibi Drink) is back with a NEW!! look & a NEW!! location for 2015. We had an exciting 2014 pushing art and music culture & now we are blessed to do this for a second year. Our goal this year is support the next generation of artists and musicians on our incredible platform. We will be showcasing a collection of the brightest visionaries in contemporary illustration, street art. Not only will we be having some of the biggest names in the business, but also offering a glimpse beneath the surface into tomorrow's most promising artists. We have an amazing line up for this month's show, art exhibited by Azarra Amoy, Mezhane Artists, Dr La Art & Nine inc & music performed by Pia Morris, Jay Alexander, Pairxdeux & Laura Jae. So come down and enjoy two incredible cultures showcase their talents with our host Letitia Hector (Venus vs Mars) and DJ Wonda Woman.